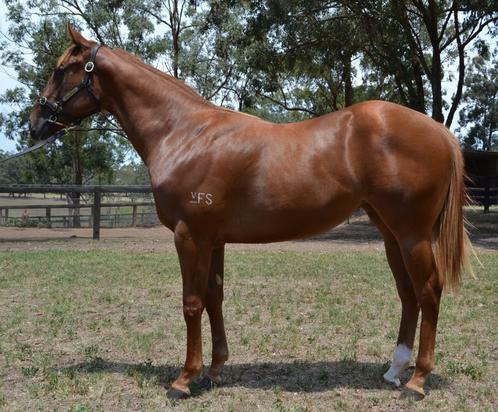 CHOISIR (AUS) (Chestnut 1999-Stud 2003). 7 wins-3 at 2, VRC Lightning S., Gr.1. Sire of 1657 rnrs, 1080 wnrs, 92 SW, inc. Olympic Glory (Longchamp Prix Jean-Luc Lagardere, Gr.1), Starspangledbanner, The Mission, Obviously, Sacred Choice, Historian, Choice Bro, The Last Lion, Japonisme, Divine Prophet, Kushadasi, Sir Moments, Dreamscape, Hurried Choice, Glory Awaits, Secret Weapon, Celtic Dancer, Stimulation, Rajasinghe, Chandlery, etc. Artie Dee Two (c. by Artie Schiller). 5 wins-2 at 2-at 1200m, 1300m, A$232,850, to 2018-19, MVRC PKF P., Friends of Epworth 2YO H., SAJC Quayclean H., 2d MVRC Device Technologies H., 3d MRC Ladbrokes Odds Boost H.
WONDERER (End Sweep). 6 wins to 1550m, A$188,000, AJC Wenona Girl H., L, STC Giddy Up Club Thursday Night H., AJC March Hare H., Nikon H., STC PJ Gallagher's Parramatta H., 2d STC Hayman, Great Barrier Reef H., 3d STC Hotel Care H. Producer. War Thunder. 5 wins from 1000m to 1600m, A$109,840, SAJC Ubet Festival of Racing H., Mac Drink Driving? Grow Up H., Goldners Horse Transport H., Happy 90th Laurel Williams P., 3d SAJC Mac Drink Driving Grow Up H., 4th SAJC WH Wylie H., L.
Allabout Glory. 5 wins to 1400m, A$132,080, ATC Royal Randwick TV on Youtube H., Villiers at the Farm H., STC Melbourne Cup at Rosehill Gardens H., 2d AJC Convention Centre H., STC Emeri Sparkling H., 3d ATC Super Saver H., Ascot Club H., AJC $25 Family Membership H., STC St Gabriel's Bexley H., 4th AJC James HB Carr S., L. Producer. Yonderstar. 3 wins at 1600m, 1800m, ATC Pride of Accountability H.
Spectograph. 3 wins from 1300m to 2100m, TTC O'Keefe's Hotel H., Breeders Incentive H., 3d TRC Cascade Premium H., Shirley Bailey H. Producer. Urquidez - Imperial Champion (H.K.) (Street Sense). 2 wins-1 at 2-at 1000m, 1100m, A$127,250, HK$1,858,975, ATC Nissan Micra Sprint 2YO H., HKJC Cricket Club Valley S., 2d ATC Royal Sovereign S., Gr.2, Rosebud H., L, HKJC Amber H., Chopard H., Tai Hang H., 3d HKJC Matheson H.
Silent Whisper (I Am Invincible). 5 wins to 1400m, A$194,640, SAJC Carrington Financial Services H., Action Line Marking H., Jims Carpet Cleaning H., Evright P., 2d SAJC Schweppes SA Sprint Final H., Darwin TC Palmerston Sprint H., MRC Grand Hotel Frankston H., 3d VRC Maribyrnong P., Gr.3, SAJC Redelva S., L, Meetings & Events Australia 2YO P., Tattsbet Adelaide Cup Day 2YO H., 4th SAJC Manihi Classic, L.
BROTO (Danzig). 5 wins from 1m to 9f, Hawthorne Derby, Gr.3. Sire. Pay Back Time (Danehill). 2 wins at 1900m, 2000m, A$86,980, STC Chiswick H., 2d AJC Frank Packer P., Gr.3, AO Allison H., 3d South Australian Derby, Gr.1, STC Tulloch S., Gr.2, SAJC Veuve Clicquot S., L.
ETE PINS (Snippets). 6 wins-1 at 2-to 1200m, NZ$90,975, CJC Flying S.H., L, 2d ARC Newmarket H., L, Cambridge Breeders' S., L, 3d ARC Guineas Trial, L. Producer. ACTRESS (Snippets). 3 wins-2 at 2-to 1400m, A$115,195, AJC Keith Mackay H., L, Reginald Allen H., L, STC Canterbury League Club 2YO H., 2d STC Quality H., 4th AJC Flight S., Gr.1. Producer. DESERT WAR (Desert King). Champion Australian Middle-Distance Horse in 2006-07. 12 wins from 1400m to 2000m, A$3,046,610, AJC Queen Elizabeth S., Gr.1, VRC LKS Mackinnon S., Gr.1, AJC Epsom H., Gr.1-twice, Chipping Norton S., Gr.1, STC Ranvet S., Gr.1, Apollo S., Gr.2, Hill S., Gr.2-twice, 2d AJC Epsom H., Gr.1, Chipping Norton S., Gr.1, 3d AJC George Main S., Gr.1, STC Ranvet Rawson S., Gr.1-twice, AJC Warwick S., Gr.2, Apollo S., Gr.2-twice, GCTC AD Hollindale S., Gr.2. LASER HAWK (Artie Schiller). 5 wins from 1400m to 2000m, A$711,750, ATC Rosehill Guineas, Gr.1, Newcastle JC Newmarket H., Gr.3, ATC Quakers Inn H., 2d Newcastle JC Newmarket H., Gr.3, 3d Australian Derby, Gr.1, ATC Randwick Guineas, Gr.1, George Main S., Gr.1. ROMANTIC TOUCH (Northern Meteor). 8 wins-3 at 2-from 1400m to 1800m, A$406,110, HK$13,471,700, M$2,500,000, to 2018-19 in Aust., HK and Macau, BRC JJ Atkins S., Gr.1, Macau Hong Kong Trophy, L-twice, ATC Australian Turf Club 2YO H., Tab.com.au 2YO P., 2d HKJC BOCHK Wealth Management Jockey Club Mile, Gr.2, Premier P., Gr.3, January Cup, L, Centenary Vase, L, Sa Sa Ladies' Purse, L, 3d HKJC Lion Rock Trophy, Gr.3, Sa Sa Ladies' Purse, Gr.3, Centenary Vase, Gr.3, ATC Eskimo Prince S., L, HKJC BMW Hong Kong Derby, L.
BURNING PASSION (Northern Meteor). 7 wins to 1400m, A$594,530, to 2017-18, ATC Hall Mark S., Gr.3, Qld Tatt's RC WJ Healy S., Gr.3, 2d Hawkesbury RC Ladies Day Cup, L, 3d ATC Liverpool City Cup, Gr.3, Show County H., Gr.3, Bill Ritchie H., Gr.3. GOBI RANGER (Tale of the Cat). 3 wins-2 at 2-at 1100m, 1200m, NZ$141,800, 3,960Rgt., S$75,735, ARC Eclipse S., Gr.3, 2d ARC Great Northern Guineas, Gr.2, Whangarei RC Westbury Stud Challenge S., L, Singapore TC Benchmark 83 H., 3d New Zealand Two Thousand Guineas, Gr.1, 4th Waikato RC James & Annie Sarten Memorial S., Gr.3. Way to the Top (Way West). 14 wins-1 at 2-to 7f, US$426,751, Saratoga Allowance, 2d Aqueduct Gravesend H., Gr.3, 4th Laurel Frank J De Francis Memorial Dash S., Gr.1, Hollywood Prevue S., Gr.3. Triple Great (Great Above). 16 wins-1 at 2-from 6f to 8½f, 3d Tampa Bay Downs Inaugural S., L, Pelican H., L, Queensbury FSIN S., 4th Tampa Bay Downs Challenger S., L.
JANFRANCO (Settlement Day). Champion 3YO colt in Peru in 1994. 4 wins from 2000m to 2200m in Peru, Clasico Derby Nacional, Gr.1, Monterrico Clasico Ricardo Ortiz de Zevallos, Gr.1, 3d Clasico Polla de Potrillos, Gr.1. Sire.